Truro’s nickname “Hub Town” is easy to understand given its convenient location for travellers heading north to Nova Scotia’s capital, Halifax, or east to Cape Breton. Its usefulness as a transportation hub dates back to the 1800s and the development of the Intercolonial Railway. Today, it is an ideal place to relax before heading on to further adventures. Descended from French settlers of the 1700s, the Acadians left an indelible imprint here. One of the most popular things to do in Truro is tasting Acadian fare at Café l'Acadie on Willow and Arthur Streets. The menu features French favorites, seafood and meat pies. Less than a mile from the café at Victoria Square, visitors can find the Tree Sculpture Project, a top attraction in Truro. Advocates began the project as a way to recognise the beautiful trees which once lined the streets and are now decimated by Dutch elm disease. Beginning near the tourist’s office, the 8-kilometre loop leads visitors past elm carvings of prominent historical figures, town emblems and native wildlife. On Douglas Street, visitors enter the lush forest landscape of Victoria Park. Things to do at this 400-acre wonderland in Truro include walking, running, biking and picnicking. The park also includes two waterfalls, children’s playgrounds and a pool for swimming in summer. Winter activities include cross-country skiing on groomed trails. A top attraction in Truro, the Marigold Centre on Prince Street offers a variety of cultural programs. This small, welcoming venue hosts musical performances, comedy acts, theatre shows, monthly art exhibits and a sports hall of fame. One hour south of Truro is Halifax, boasting the Victorian-influenced Public Gardens, dating back nearly 140 years. Visitors can admire fountains, ponds filled with ducks, statues and stately willows. Inexpensive ferry rides to Dartmouth allow visitors to take in Halifax’s important historic harbor on their way to the neighboring city. The largest indoor show in the world takes place each July in downtown Halifax. The Royal Nova Scotia International Tattoo is an exciting showcase of Acadian culture, pomp, splendor and acrobatics. The festival pays tribute to the Royal Canadian Mounted Police and Canada’s military forces, and it features workshops, parades and music. From Truro, visitors can also head east to Cape Breton, just four hours by car. The 300-kilometre Cabot Trail, one of the continent’s finest scenic routes, is chiseled from majestic cliffs and canyons along the sea. Interpretive signs and photo viewpoints lace the route. Driving the trail is a day trip, but visitors can extend their stay by exploring the adjoining Cape Breton National Park, where options include everything from whale watching to camping, hiking and golfing. The park’s west entrance at Chéticamp is a good option and is accessible via Exit 7 from the Trans-Canada Highway. Or, for a truly unique Truro experience, visitors can continue this breathtaking, world-famous car trip and discover why adventurers past and present have been drawn to these wild and picturesque places. Ski Wentworth is a Canadian alpine ski hill in Nova Scotia's Cobequid Hills. 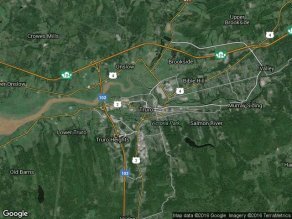 Ski Wentworth is located in the hamlet of Wentworth in the Wentworth Valley, 48 km northwest of Truro and 67 km east of Amherst on Trunk 4.